Parents who want their kids to have a great time at camp this summer should start making a few phone calls today. Gathering information, talking with camp directors and visiting the facilities go a long way toward ensuring a good summer camp “match. Pre-camp prep is easier now more than ever; a great place to start is the American Camp Association website, campparents.org. The ACA lists 2,400 accredited camps that serve more than 5 million kids each year. The camps have met well-defined standards that cover safety, counselors and other issues. Its Find A Camp web directory has an easy-to-follow set of questions that leads parents to camps (both ACA and non-ACA camps) based on gender, age, location, day or overnight options, activities, abilities, cost, affiliation (religion or cultural) and other features. All sorts of camps are included: sports to leadership to traditional outdoor activities. The lists are good places to start, but far from the only things parents should check. Camp directors and others say that a good camp experience is contingent upon many factors, including health or dietary issues, the use of technology, and accommodating special needs. A traditional outdoor camp can be a great way for kids to get acquainted with nature. But remember, this generation is plugged in. They text. They Tweet. They use Instagram and Facebook and all sorts of social networks to stay in touch with friends and parents. Disconnecting, even for a brief time, can be traumatic. The ACA reports that 74 percent of its camps do not allow any personal electronic devices at any time (with the exception of those that are medically necessary). The most popular form of communication during sleep away camps is handwritten letters or postcards (84 percent of camps). Some camps have flexible electronic policies, allowing a weekly email from parents or other occasional phone conversations. Concerned that going “cold turkey” may be too unsettling for your child? Then find out what the camp’s policy is in the unlikely event of an emergency or illness. When is a parent contacted? Who makes the call or sends the text? What happens if a child violates the no-tech rules? Keeping kids busy, engaged and focused on small group activities helps distract them from missing technology, says Diane Kanney, who oversees camps at St. Joseph Academy in Cleveland. 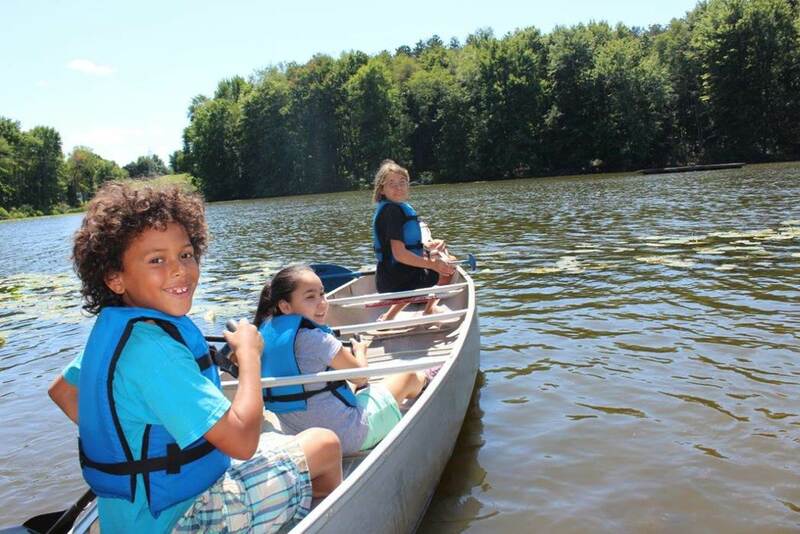 About 500 boys and girls go through the school’s various camp programs each summer, ranging from sports to academic enrichment to leadership camps. Counselors work hard to get the students fully involved in whatever activity they are doing. There’s very little opportunity to use a cell phone when they are kicking soccer balls, Kanney points out. For children with special needs, hundreds of camps offer integrated options (with accommodations) or programs designed solely for children with special needs. One example is the Akron Rotary Camp, managed by Akron YMCA and located on Portage Lakes. The camps, for ages 6 through adult, include day and overnight sessions. J.D. Detsch, program director at the Akron Rotary Camp, encourages parents to fill in the registration forms (provided by camps) as completely as possible and to be candid about their child’s needs. Also, parents should ask about the staff and how they will be managing a child’s health care needs during the camp program. Detsch says the Rotary Camp has an on-staff nurse who can assist with a wide range of health challenges. For example, children who need tube feeding can be accommodated, as well as those who have other medical issues. A good camp experience fosters confidence and independence. “We always try to see if they can do more than what they initially thought,” Detsch says. Kids with medical issues such as asthma or diabetes can help avoid potential problems if parents talk about it with staff – and with their kids – long before camp begins. She recommends parents work with their kids to recognize what she calls “teachable triggers” that can indicate an imminent asthma attack or migraine, for example. Such responsibility on a child’s part – within reason – helps foster independence in other ways. Dealing with allergies — whether food or other types such as insect stings — at camp can present an intimidating gauntlet for kids, as well as their concerned parents. Parents should ensure camps are taking all the proper steps to keep their kids safe while away from home. Detsch recommends letting the staff know early if allergies are an issue. That allows counselors and others to keep a watch on what young kids eat and to remind older kids if they take a misstep. Before choosing a camp, parents should have a list of questions regarding camp procedures when dealing with allergies. Parents also should talk to the camp about an action plan if there’s an allergic reaction. Consider questions such as: Who will have access to the medicine and where will it be located? Who will administer the medication, if needed? Where is the nearest hospital and how long will it take to get there, if there is an emergency? While many camps provide an assortment of healthy food, including fresh fruits and vegetables, temptations do exist. If a child has never made his own food choices, camp can present a challenge. Conversely, camp can expose children to foods they may not get or are unwilling to try at home. Check the camp website for a typical menu or ask for a sample menu and review it with your child before he or she goes to camp. Identify “always” and “sometimes” foods. Negotiate a reasonable number of times when the “sometimes” foods can be eaten – once a day, three times a week or an “anything goes Friday,” Rice suggests. Talk to your child about the importance of eating balanced meals. Focus on how good food choices will give them more energy for fun camp activities. Practice. Many camps have salad or food bars with a wide array of food choices. Find a salad bar or buffet before camp starts and help your kids choose among the “always” foods – dark, leafy greens, carrots and other healthy vegetables, along with a lesser amount of other foods like croutons, creamy dressings or crackers. Preparation can make or break a camp experience. Research, talk to camp directors, be candid about your child’s needs, and go over expectations with everyone involved before camp begins. Camp has the potential to be an exciting and liberating experience for children of all abilities and backgrounds.